Unilever East Africa announced a corporate gift to the KBT to help build it’s activities in East Africa. The pledge of Ks2,679,600 (approx $31,000) will help the KBT further its critical activities to help spread literacy among blind and visually impaired students in Kenya, Tanzania, and Uganda. The KBT is extremely grateful for the support and generosity provided by Unilever. 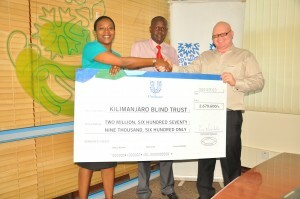 “An initiative by Kilimanjaro Blind Trust (KBT) that seeks to ensure that every school-going visually impaired child gets a braille machine received a boost yesterday after Unilever donated over Sh2 million for the cause. Unilever East Africa Corporate Affairs Manager Susan Njoroge said learners with special needs have not benefited from the free primary education because not much has been done to give to them learning facilities.